Superior 92330 is a Utility Pump (with a thermoplastic casing) designed to move water from the pit to a fairly decent head height. Equipped with a sturdy 1/3HP motor, it does a very good job moving up to 2400 gallons of water per hour. It also has a one piece motor housing whose deign ensures robustness as well as better heat dissipation, keeping the motor cooler. The Superior 92330 Pump has two O-ring seals that prevent water from seeping into the housing. The pump has a 1-1/4 discharge, which means more water gets pumped quicker. The pump has a tethered float switch meaning the pump can automatically turn on or off. The Superior 92330 submersible pump with tethered float is an easy to use pump which works well for removing pool cover water and several applications. It has a simple float mechanism which turns the pump on and off based on the amount of water stored inside the pit. This is a well-constructed utility pump with multiple uses. Basically, it does a great job of pumping water anywhere where there is standing water. It can also be used for multiple applications from draining a water tank or pool to drawing water that has accumulated over a pool cover. 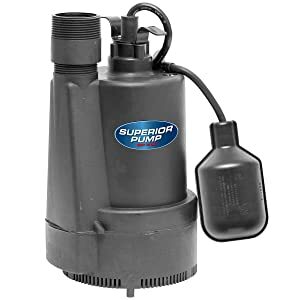 Listed below are some impressive features of this Superior sump pump which is considered one of the best in its class. The submersible pump’s housing is made of a corrosion resistant thermoplastic. The ability for the heat to dissipate quicker ensures that the pump runs more efficiently and for longer. The 4.1 Amp motor is powerful and energy efficient and does not stop until it pumps out 40 gallons of water per minute right down to 1/8” from the bottom. The 1-1/4” discharge makes for a high throughput. Equipped with a split capacitor, which enables the pump to be more powerful, and to run non stop without actually drawing more energy. The double seals at the bottom of the motor plate protect the motor from water seeping into the motor housing. The tethered float switches the pump on and off which means the pump doesn’t require constant supervision. The float switch of the pump has to be almost even with the tip of the casing for it to get triggered. The body of the pump is roughly 9 inches tall, not including the top attachment. Anyway, the pump works well when submerged like in a pool or a crock. However, it won’t get engaged if the water is less than approximately 9 inches deep. If you wish to have it engaged at 7 inches or less, you’d have to set the float low to suit your needs. Quiet motor and a soundproof enclosure set a standard for quietness in the industry. It does handle clogs well and deals with chunkier particles better than the rest however if you’re thinking about using it in your pool, it’s good to have a mesh screen that can filter leaves and debris from being sucked in and can also be removed for cleaning. Several reviews mention that one of the main problems with this pump is that it’s quite difficult to find a fitting for the output to go from that size to a standard hose size. The lack of an adapter (within the package) to allow this pump to work with a hose of standard size is certainly disappointing. The tethered float switch attaches only at the top of the pump, which means that the pump itself needs to be under a few inches of water before it can begin to work. Some people could find this cumbersome. If it were on the side of the pump it could improve the on/off cycle of the pump. It’s is priceless when you need it, yet it costs less than other top rated sump pumps in its class. If you’re considering buying a submerged sump pump, look no further. It’s more than worth it.